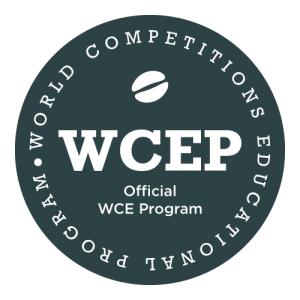 The World Competitions Educational Program consists of modules developed by World Coffee Events, designed to provide competition training for all interested parties. These modules are open to aspiring judges, national judges, competitors, or any interested party, and focus on understanding competition from a judging perspective. Instructional modules cover Rules & Regulations, score sheets, judges’ stage behavior, and focus on the competencies required of a world-level judge that are tested in WCE’s Judge Certification. Taking the WCEP can help in learning judging skills, understanding how competitions are scored, and improving overall competition knowledge. The WCEP counts as one year of National Body judging experience, for those who are aiming to take WCE Judge Certification test to become a WCE Certified Judge! After completing a WCEP date, applicants must wait at least 1 months before applying for a WCE Judge Certification. This is the minimum amount of time required to apply the skills learned at a WCEP.